Locally distilled gin offers a tantalizing taste of Northern Michigan terroir. Lavender buds picked from glowing purple fields in Antrim or Emmet Counties provide a sweet floral undertone. Spruce tips, jack pine seed and juniper berries invoke the essence of a pine forest warmed by September sunlight. Savory herbs like sage leaf and coriander channel the farm plots and herb gardens sown throughout Leelanau County. Gin, made by macerating and distilling botanicals in a neutral grain base (read vodka), is arguably the most intellectual of the clear spirits and manifold flavors make up the base for hundreds of classic and modern cocktails. With the craft spirits craze at full steam, Northern Michigan’s microdistilleries are harnessing field and forest to distill small batch gins of world-class quality. 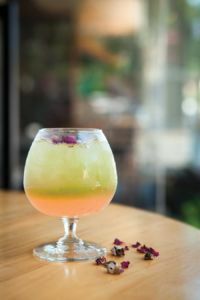 This take on the barrel-aged style of gin known as Old Tom utilizes a blend of seven botanicals. The finished spirit ages for six months in rye and bourbon barrels, where it assumes smoothness and a subtle whiskey soul. High tone floral notes underpinned with conifer, citrus peel and sage dominate Mammoth’s Old Dam Gin. Civilized’s hoochmeister, Mike Hall, riffs on the light, bright, juniper-driven “London Dry” style of gin with a pure, precise spirit well suited to classic martinis. Jack pine seeds from the forests of Leelanau County add a distinct piney edge counterbalanced with sweet lavender notes. Concolor Fir sprigs and a balanced juniper infusion bring a complex forest essence to Iron Fish’s Woodland Gin. Eros is Latin for forager, fitting as this is the first gin in Michigan to utilize 100 percent wild-foraged native botanicals. Eros has a complex nose of citrus and light conifer with a tinge of pepper to keep things interesting. Celebrate summer’s end with local gin mixed in these simple classic cocktails. Thanks to Poppycocks for sharing their recipes! Shake gin, rose syrup and lemon juice. Pour into cocktail glass, with ice. Top with sparkling wine. Layer cucumber juice and drop of rose water. Place all ingredients in a pan and bring to a boil. Cool for 24 hours then strain. Refrigerate. Discard rose petals. Add gin, lime juice and cucumber to cocktail shaker, muddle, add ice and shake thoroughly. 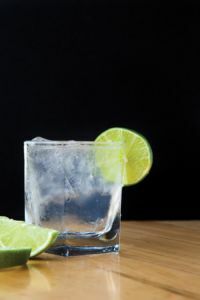 Strain cocktail into an ice-filled old fashioned glass garnished with lime and cucumber slice. Lime slice. A good juicy one. Add gin, vermouth and bitters to a cocktail shaker filled with ice. Stir (or shake) vigorously until chilled. Strain into chilled martini glass and garnish with lemon twist.